In 1811, before anesthesia was invented, Frances Burney d’Arblay had a mastectomy aided by nothing more than a wine cordial. She wrote such a gripping narrative about her illness and operation afterwards readers today still find it riveting and informative. Fanny came from a large family and was the third child of six. From an early age, she began composing letters and stories, and she became a phenomenal diarist, novelist, and playwright in adulthood. Certainly, her skillful writing was a primary reason her mastectomy narrative had such appeal. Fanny grew up in England and had been embraced by the best of London society. She had served in George III and Queen Charlotte’s court as Second Keeper of the Royal Robes. Moreover, she was admired by such literary figures as Hester Thrale, David Garrick, and Edmund Burke. Fanny also befriended Dr. Samuel Johnson, the English writer who made significant contributions to English literature as a poet, essayist, moralist, literary critic, biographer, editor and lexicographer. In fact, some of Fanny’s best revelations are about Johnson, how he teased her, and the fondness that he held for her. In 1793, Fanny married Louis XVI Alexandre-Jean-Baptiste Piochard d’Arblay and became Madame d’Arblay. D’Arblay was an artillery officer who served as adjutant-general to the famous hero of the American Revolution, Gilbert du Motier, Marquis de Lafayette. D’Arblay had fled France for England during the Revolution just as had many other Frenchmen. However, in 1801, d’Arblay was offered a position in Napoleon Bonaparte’s government. He and Fanny relocated to France in 1802 and moved to Passy (the same spot where Benjamin Franklin and the princesse de Lamballe had lived), and they remained in France for about ten years. While living in France, Fanny suffered breast inflammation in her right breast in 1804 and 1806. 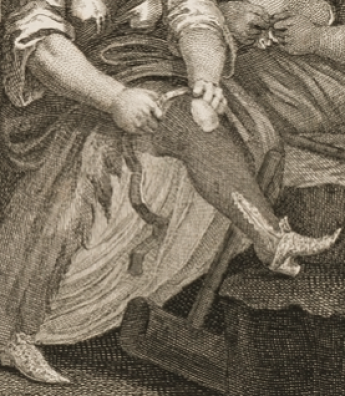 She initially dismissed the problem but then in 1811 the pain became severe enough that it affected her ability to use her right arm. Her husband became concerned and arranged for her to visit Baron Dominique-Jean Larrey, First Surgeon to the Imperial Guard, as well as the leading French obstetrician, surgeon, and anatomist, Antoine Dubois. Despite the excruciating pain, Fanny lived through the operation, and her surgery was deemed a success. Larrey produced a medical report about his brave patient stating that he removed her right breast at 3:45pm and that Fanny showed “un Grand courage.” Courageous as she was, there was no way for doctors to determine if Fanny’s tumor was malignant or if she suffered from mastopathy. Fanny’s healing took a long time, and while still recuperating, she and husband returned to England in 1812. Six years later, in 1818, her husband died from cancer, and she died twenty-two years later, at the age of eighty-seven, on 6 January 1840 in Lower Grosvenor-street in London. As Fanny had requested, a private funeral was held in Bath, England, and attended by a few relatives and some close friends. She was laid to rest in Walcot Cemetery, next to her beloved husband and her only son Alexander, who had died three years earlier. Their bodies were then moved during redevelopment of the Walcot Cemetery to the Haycombe Cemetery in Bath and are buried beneath the Rockery Garden. Geri Walton has long been interested in history and fascinated by the stories of people from the 1700 and 1800s. This led her to get a degree in History and resulted in her website, geriwalton.com which offers unique history stories from the 1700 and 1800s. Her first book, Marie Antoinette’s Confidante: The Rise and Fall of the Princesse de Lamballe, discusses the French Revolution and looks at the relationship between Marie Antoinette and the Princesse de Lamballe. That account is chilling. Really makes you appreciate some of today’s advances. Fun fact, anaesthetic and dentistry are widely considered to be the biggest advantages of living now, as opposed to the past. Thanks for posting this. I could see that! I always think of penicillin, more reliable contraception, and knowing about hand hygiene! I can’t imagine what this must have been like. I hope there was laudanum in that cordial! Absolutely. It’s a wonder anybody survived surgery at all. The pain alone could have been enough to kill. Wow, did not know that about Mrs. Burney. How terrible! Her account is so vivid I could almost feel it. She may have lost her breasts but she certainly had balls!